Is regular tyre rotation important? Regular tyre rotation is super important to keep drivelines in top shape. Different tyre diameter as a result of mismatched tyres or uneven wear, can cause a lot of damage in these cars. Some vehicle manufacturers will recommend only full, matching sets of tyres be fitted to prevent this damage. It’s recommended you rotate according to the above recommendations and always consult with your vehicle dealer to find the right tyres for your car. How do I extend the life of my tyres? You can extend the life of your tyres by following simple tyre maintenance. Should I rotate my spare tyre? How frequently should I have my tyres rotated? Many manufacturers recommend tyre rotation at least every 10,000km. If you’re noticing uneven wear patterns, its recommended more often. If you’re experiencing uneven tyre wear a wheel alignment, maintaining correct tyre pressure and even changing the type of tyres you’re using may help. You can check out simple tyre maintenance which could help extend the life of your tyres if they’re wearing faster than they should be. What are the benefits of tyre rotation? Front and rear tyres do different jobs so they usually wear at different rates. The tread on your tyres is what keeps your family safe on the road. This is why tyre rotation is so important. When you regularly rotate your tyres you’ll not only be safer, but you’ll even out any irregular wear patterns and extend the life of your tyres too. In the past, tyre rotation was straightforward. It was a simple front to back or diagonal side-to-side rotation. Now with the widespread adoption of spare wheels, uni-directional and asymmetrical tyres, tyre rotation is a little more complex. To help you reduce tyre wear and tear we recommend chatting to an experienced tyre dealer, or following your vehicle manufacturer’s guidelines. Can a tyre be too old? Some experts believe a tyre should be replaced after 5 years, although this is not recognised by law. You can legally drive on a tyre that’s at an acceptable tread and is in good nick, regardless of its age. It’s important to remember tyres can wear down in hot climates. If your tyre is exposed to excessive heat, like the spare in your boot, it may reduce its lifespan, whether you’re driving on it or not. Choosing a car tyre to suit your driving can help you save money. If you often drive on wet roads you’ll get more wear and tyre safety with a chunkier tread that can disperse water. If you’re driving longer distances, a tyre with a firm grip will last longer, saving you money on tyre replacements. Why is caring for your tyres important? How often do you think about your tyres? If you’re like most motorists, you’ll hardly give them a second thought until you need a tyre replacement. With a little care you can extend the life of your tyres and improve your car performance, fuel consumption, safety and comfort on the road. We’ve got advice on repairing, replacing and caring for your tyres so you can drive further, for less. As tyre technology continues to improves, consumers are being given a choice to buy tyres that are more environmentally friendly. This tyre technology lowers the rolling resistance which reduces fuel consumption. The less fuel a car uses the less C02 emissions are let into the atmosphere. Run flat tyres provide an extra layer of safety and are designed to be driven on for a certain distance after a tyre loses pressure. After losing tyre pressure, the driver must maintain a steady speed of no greater than 80km/h, for a maximum distance of between 50km – 80km (depending on the tyre brand). Run flat tyres may only be fitted onto vehicles specifically manufactured to accommodate Run Flat tyres and these vehicles always have a functional Tyre Pressure Monitoring System (TPMS). Typical vehicle manufacturers that utilise Run Flat tyres are BMW, MINI, Mercedes and Renault. Please note – the fitting of run flat tyres should be carried out by a specialised fitment centre or Dealer. All cars must carry a spare tyre in case of a puncture. However tyres are large in size and can take up a lot of room especially in smaller vehicles. This is where a space saver can be used. As the name suggests it is a replacement tyre for your car that is smaller in size than regular tyres. Space savers are not designed to be driven on for long distances and should only be used to get you home or to a tyre dealer. Space savers must be driven at a speed limit of 80km and can affect the handling and control of your vehicle. It is therefore important that you drive with extra care when using space saver tyres. The placard (found in the driver’s door area, glove box or under the fuel cap) will tell you the correct pressure for your car’s front and back tyres. Make sure the tyres on your car match the placard sticker. Your cars previous owner may not have matched new tyres with the placard, meaning the required tyre pressure will differ. The pressure on the placard is called COLD pressure, which is the tyres pressure before you have driven your car. Driving your car increases the pressure, so you need to take the measure while your car is still cold. A Tyre placard is a very handy reference when buying new tyres. Most placards will be found either on the driver’s side door, in the glove box or under the fuel cap. This sticker will show you the tyre type, size, and speed rating you need to look for. The placard will also show you the correct inflation pressures for your front and back tyres. What is tyre speed rating and load index? 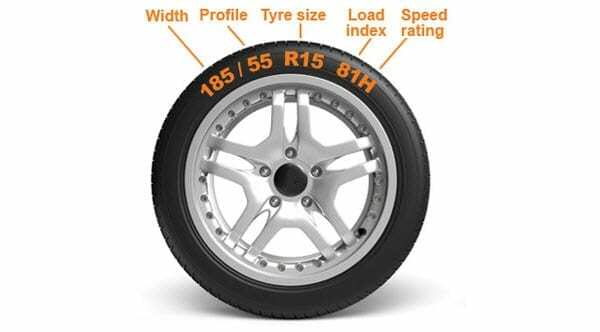 The tyres load index and speed rating can be found by looking at the two digit number and letter at the end of the sequence displayed on your tyre. Using the example above, 81H is the maximum load capacity and speed at which the tyre can safely operate. The speed index for passenger car tyres normally sit between “t” and “Y” which equates to 190-300km/h. The load index for passenger car tyres normally sits between 60 and 110, which equates to 250-1060kg/tyre. Refer to the below charts to find your tyres load index and speed rating. How do I find my tyre size and what do the numbers mean? A tyre’s size is found by looking at the sequence of letters and numbers written on the tyre sidewall. For the below description we will use the example 185/55 R15 81H. Width – The first 3 digit number (185 in the example below) is your tyre width measured in millimetres. Profile – The next two digit number (55 in the example below) is the tyre’s profile. This measurement is taken from the wheel to the outer circumference of the tyre and the number is a percentage of your tyre’s width. So in this example, the profile is 55% of the tyre’s width of 185mm. Rim Diameter – The next two digit number is the diameter of the wheel rim measured in inches. The example below has a tyre that is 15 inches. Load Index – The next two digit number is the Load index that uses a reference table to find the load capacity of the tyre in kilograms (shown below). Speed Rating – the final letter refers to the speed rating which also uses a reference table to indicate the maximum speed for the tyre in kilometres (shown below). As a general rule, tyres should be replaced when the tread depth gets below 2mm. To tell the depth of your tread, look for the wear indicators, which are rubber blocks found in four grooves that run around the tyre circumference. The wear indicator is 1.6mm thick, which is the legal limit in Australia. If your tyres reach this minimum depth they must be changed or you are breaking the law and putting your own safety at risk. Why do some tyres have different diameters? Sometimes cars will use front and rear tyres that have different diameter and/or width. This means that depending on the type of tyre, you’ll only be able to rotate them side to side on the same axle. Check out your tyres and follow the manufacturer’s advice on how often to change and rotate these tyres. Unlike standard tyres, asymmetrical tyres have a tread pattern that differs side-to-side. This means they can be designed to perform different tasks. In Queensland’s wild weather asymmetrical tyres can be made with one side being optimal for wet driving conditions, with the other side offering good cornering. Asymmetrical tyres need to be fitted to the wheel in a particular orientation to ensure they work correctly. Check out their sidewalls as they’ll be marked to help with this. Like uni-directional tyres, most manufacturers will not recommend rotating asymmetrical tyres side-to-side. Uni-directional tyres are designed to turn in one direction only so can’t be rotated side-to-side. Their sidewalls are marked with an arrow to indicate their correct rotational direction. These markings help out when you’re installing them so you’re sure they’re moving the correct way. Tyre sealants are a great temporary solution to seal small punctures. Sealant kits give you time to drive to a dealer for a tyre replacement or a more permanent repair. Be cautious of sealant products used to prevent flat tyres. They often won’t work correctly and there’s a risk they’ll hide problems, causing you to drive on an unsafe tyre. If you’re wanting to prevent flats, the best tyre care includes inflating your tyres to the correct pressure and having your wheels aligned. Should I have my tyre repaired? If you’ve got a puncture there’s a good chance you can get it fixed before needing a tyre replacement. Plugs fitted from the outside offer a good temporary repair, but may not be a permanent fix. If you’re considering a tyre repair, remember it can only be completed in the tread area and in all cases, it’s best to have it fixed by a professional who can check for internal damage. Re-treading tyres was once a low-cost option to repair tyres instead of replacing them. As the price of new tyres has reduced, the demand for re-treads has too. While it’s still a solution for your passenger car, it’s most commonly used for trucks and heavy vehicles now. What is the best tyre? For one person, the cheapest, longest-lasting tyre will be the best. For someone else, tyre safety is most important so they’ll spend a bit extra and choose one with more grip. Each tyre has its own pros and cons. High-performance tyres have a higher grip but can wear down quickly. Grooved tyres can move water around and are safer on wet roads, but may be noisy. To help you choose the right tyres, consider what roads you’ll drive on, the climate, your car make and your budget. Have a chat to a tyre dealer and they can point you in the right direction. If you’re still unsure, stick to a well-known mainstream brand and you’re usually on to a solid choice. When tyre safety matters, remember you’ll get what you pay for. Do different tyres affect my car? It’s not a myth – different tyres can affect the performance of your car. Wrong tyres increase fuel consumption and make your car difficult to handle. With the right tyres your car will be safer, cheaper to run and you’ll have a smoother ride. We’ve got some pointers on choosing the best tyres for your set of wheels. What is the difference between wheel alignment & wheel balance? Fitting and balancing of your tyres is provided free with your Tyre purchase. Once your vehicle is on the hoists, each tyre goes onto a balancing machine. The machine spins the tyre at a high speed to measure the wheel/tyre combination imbalance. It signals how much weight should be added to balance out the tyre and the areas where the weight is needed. As explained above a wheel alignment relates to the angles of the wheels and axles of your vehicle in relation to steering and suspension with your wheels. What is a wheel alignment and what’s included? A wheel alignment involves using special machinery to adjust the angles of your vehicle’s axles and wheels so that they point straight ahead/according to manufacturer specification. To the naked eye, your wheels may look like they are pointing straight, but even the slightest amount of difference could be enough to cause uneven wear for your tyres. Driving onto the kerb, driving through a pothole, driving on unevenly surfaced roads – all of these things could be enough to cause your wheel alignment to be out. The Wheel Alignment offered is a Standard Alignment and can only be performed on Standard Vehicles. Excluded vehicles are: all European vehicle makes, luxury vehicles, classic vehicles, modified vehicles, performance vehicles, racing vehicles.